97.3 wins every survey of 2015 and ends the year on top with 13.5%, brekky #1 FM 13.6%. 97.3 13.5% Time to celebrate (again) for the ARN-managed JV between ARN and Nova Entertainment. The station has blitzed the market this year winning all surveys. Its year high 10+ share was 14.6% in survey one and it hit 14%+ again in surveys two and four. Breakfast with Robin, Terry and Bob had a great year too, ending #1 FM on 13.6% with a year high of 14.0% in survey one. Hughesy and Kate surrendered the second place drive spot to Nova this survey. The station remains the clear leader 40-55 and #1 FM 55-64. Nova 106.9 12.7% The decade-old station closed the gap on 97.3 significantly to end the year. The gulf between the two dropped from 2.5 in survey seven to 0.8 of a point in survey eight. The year’s best 10+ share came in survey four with 13.2%. Breakfast with Ash, Kip and Luttsy experienced several highs and a memorable low. The show says goodbye to 2015 on 11.9%, a lift of 1.2 from the previous survey. Its biggest breakfast share was 13.5% in survey five. 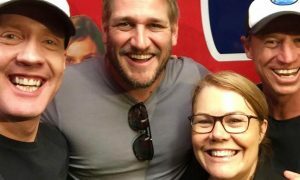 Afternoon was up 3.0 this survey to 14.5%, while Kate, Tim and Marty are now #1 in Brisbane, up 1.2 to 14.5%, taking the mantle from hit105.3. hit105.3 10.7% Falls in breakfast and drive this survey led to 10+ share dipping 0.2. The station remains close to its year best 10+ share though of 10.9% in survey seven. Breakfast with Abby and Stav will add Osher Gunsberg next year. The duo ended their year on 8.7% (-0.5) after posting a year high of 9.5% in survey one after farewelling Labby at the end of 2014. Hamish and Andy have given up the #1 drive slot with share down 1.5 to 12.5%. The station remains #1 18-24. 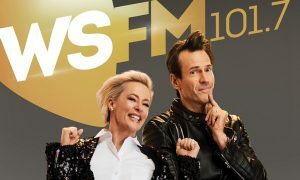 4MMM 8.4% Breakfast hosts Marto and Ed Kavalee contributed to the station’s share backing off 0.7 after a string of surveys with 10+ all above 9% earlier in 2015. The breakfast show was down 1.5 to 7.8%, close to the year low of 7.6% in survey two. The breakfast high was 9.7% in survey six. 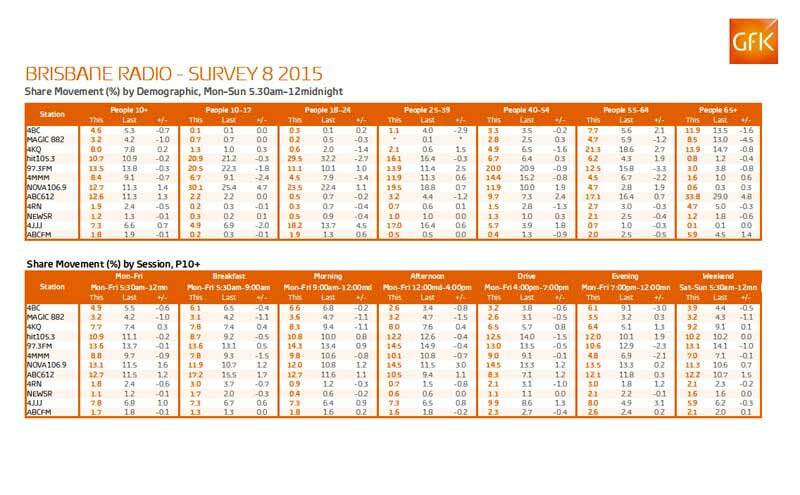 4KQ 8.0% Share edged higher this survey, but remains behind its best of 8.7% in survey two. Consistent numbers though across the year with all moves within a point of the high. Breakfast with Laurel, Gary and Mark closed off 2015 on an improved 7.8% (+0.4) with a year best of 8.7% in survey one. Share 55-64 lifted 2.7% to finish the year on 21.3%. 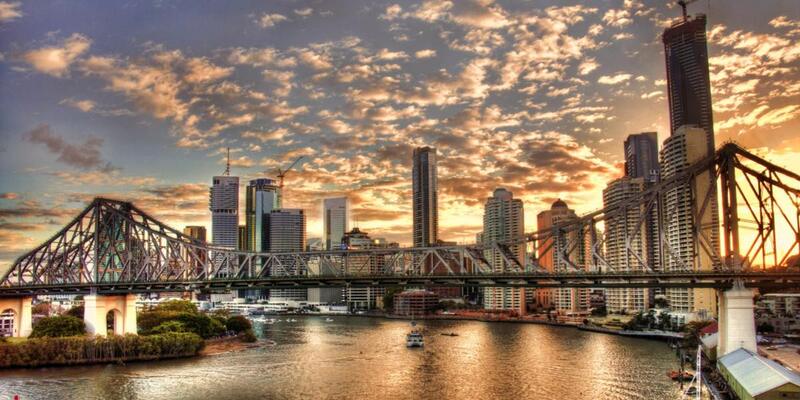 4BC 4.6% The move to broadcast Alan Jones and Ray Hadley into Brisbane has saved money and kept the ratings steady. The 10+ share has ended the year better than it started on 4.0% in survey one. However along the way it peaked at 5.9% in survey six. Breakfast with Alan Jones has ended 2015 on 6.1%. Again that is better than survey one’s 5.1%, but behind the high of 6.5% in survey seven. Ray Hadley had the best share this survey, with morning on 6.6%. Magic 882 3.2% Share was down a point this survey, and nearly two points behind the 5.0% recorded in survey four. Breakfast tumbled 1.1 to 3.1%, trailing the 5.3% in survey three.